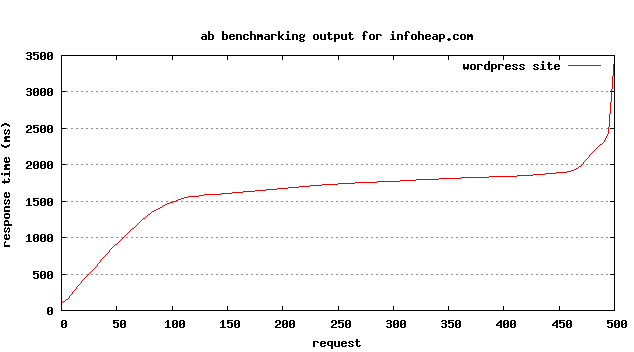 ApacheBench (ab) is a very handy webserver benchmarking tool which can be run from command line. It is extremely simple to use. A quick outcome can be obtained in just one minute. It does not require too much much familiarity with load and performance testing concepts. No complex setup is required. It gets installed automatically with apache. It does not have all the features of more popular tools, but it is good for a start. You can increase the total requests. It should always be more than number of concurrent requests. You can also add -H "Accept-Encoding: gzip,deflate" to more closely emulate real requests. But as we are on same server and there is no network overhead, it will not matter too much. For such high number of request the test should be done locally or on same LAN (Local Area Network). Otherwise you may get bad results due to network latency and you may think its your server problem. In reality all you concurrent users won’t come from one machine. This tests does not emulate the real environment fully. But it is good enough to help you find out most of the major problems in your site. Total data transferred is 12305000 bytes for 500 requests. Close to 20K per page (un-compressed). Which is inline with my home page size. Test completed in 8.978. No failed requests. Very good number I think. Requests per seconds: 55.69. Pretty good number. Transfer rate: 1338.39 [Kbytes/sec] received. Since we ran the test on same machine, this number was expected to be high and can be ignored. In connection time stats, you can see many requests had to wait for few seconds. This may be due to apache putting requests in wait queue. Overall test results are good. This test does not really tested the network latency. But it primarily tested if 100 concurrent requests reached to the web server, how does it perform. And then plotted it using gnuplot. Here is the outcome.